At our practice, Dr. Swearingen and our team like to put most of our efforts into prevention, because as we all know, stopping a problem before it even begins is much easier than simply fixing it later! When we take this approach with your dental care, your smile will not only look and feel much better over time, but you’ll also spend less time in our office as the years go by! 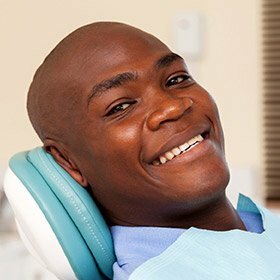 With these services, we’ll make it so the next time you laugh, eat, or smile, the last thing you'll be thinking about is your teeth. To schedule your next preventive appointment, contact us today. When it comes to protecting your oral health and giving you a beautiful smile, checkups and cleanings are the gold standard. We recommend that every patient over the age of three should have at least two checkups and cleanings each year in order to prevent the most common dental problems, including tooth decay, cavities, gum disease, and more. During these appointments, everything will start with a thorough oral exam performed by Dr. Swearingen. He’ll look at each of your teeth, gums, jaw, and any existing dental work to make sure they are all in good shape. If he spots a problem, he can recommend a treatment that will take care of it well before it has a chance to affect your smile. And afterward, our hygienist will use specialized tools to give you a dental cleaning. This will remove all of the plaque and tartar that has accumulated on your teeth that can lead to cavities, plus it will help break up surface stains to leave your smile nice and white! Periodontal therapy allows us to tackle the most common dental problem we see every day: periodontal disease. Also known as gum disease, this infection of the gums and bone that support the teeth can lead to symptoms like chronic bad breath, gum recession, and even tooth loss! We’ll screen your gums whenever you come to see us, so if you show any signs of the infection, we can quickly take care of it with scaling and root planing, a deep cleaning designed to attack periodontal disease right at its source. 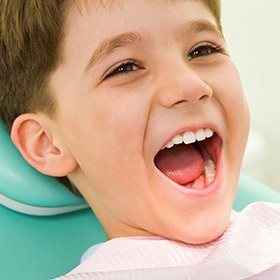 Early-age dental appointments are absolutely essential to making sure your little one’s smile stays healthy and strong throughout their lifetime. When you bring your child to see us, we’ll help protect their teeth from cavities, make sure their mouth is developing correctly, and even teach them the basics of dental care to make your job at home a little easier. Most of our team members are parents themselves and have decades of experience treating children, so they’ll know just how to keep your child comfortable every time they visit. Dental sealants allow us to place an invisible barrier on your teeth in order to protect them from the plaque, food particles, and bacteria that can lead to tooth decay and cavities. They are made of a clear, plastic-based substance, and most of the time, we only need to apply them to the vulnerable back teeth, as these are the hardest to clean (especially for young children). They only take minutes to place and can provide years of round-the-clock cavity prevention. Bruxism is a very common condition where a person clenches their jaw and grinds their teeth while they sleep, and if left untreated, it can wear down the teeth, make them more sensitive, and eventually cause them to break! 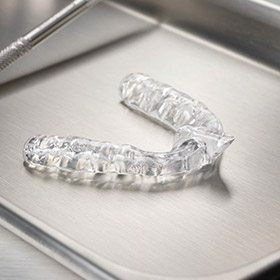 To keep your teeth safe so you can rest a little easier, we can recommend that you wear a custom-made mouthguard to bed called a nightguard. This small appliance will place a firm but comfortable barrier between your teeth in order to prevent them from grinding together. 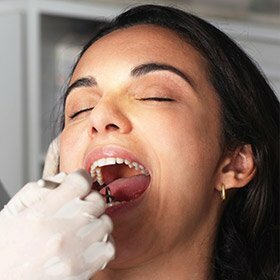 Oral cancer rates are currently on the rise here in the U.S., and early detection is absolutely essential to the successful treatment of the disease. This is why Dr. Swearingen recommends that all adults should have at least one oral cancer screening per year. He can perform one as part of your regular checkups to make sure you’re never caught off guard by this disease. It only takes a couple of minutes, but it could literally be the thing that saves you or a loved one’s life. For a very long time, fluoride has been known to help strengthen the teeth against both decay and cavities, which is why you’ll so often find it added to toothpaste and even public water sources. To help keep your family’s smiles extra protected between appointments, we can provide a topical fluoride treatment as part of your regular checkups. 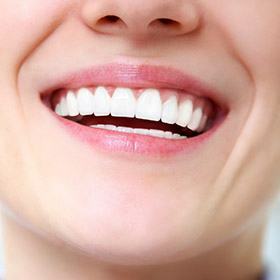 It only takes a few minutes, is completely painless, and it can help keep everyone cavity-free all year!